On Mac OS, click the Wi-Fi icon in the OS menu bar to choose a wireless network. In Windows XP, choose Start > Control Panel > Network And Internet Connections > Network Connections > Wireless Network Connection. In Windows Vista/Windows 7, choose Start > Control Panel > Network And Internet Connections > Network And Sharing Center. On the iPad, tap Settings and then tap Wi-Fi. Alternatively, your computer can be hardwired (connected via ethernet) to your wireless router. And your iPad can be connected to that router via wifi. Note: For more information about connecting Photoshop and its companion apps, see Adobe’s support document Troubleshoot companion app connectivity problems | Photoshop or watch Getting started with Photoshop companion apps for Photoshop CS5 on Adobe TV. Important: Using Photoshop with ColoRotate requires Photoshop 12.0.4 or later. If necessary, choose Help > Updates to install the latest version of Photoshop. Establish Photoshop as a remote connection to the apps. In Photoshop, choose Edit > Remote Connections. Create a remote connection in Photoshop. In the Service Name field of the Remote Connections dialog box, enter a descriptive name. In the Password field, enter a six-digit password. Select Enable Remote Connections and then click OK. In ColoRotate, tap the PS icon in the upper-right corner of the app. In the Connections window, tap your Photoshop service. Enter the six-digit password and tap Connect. When the connection is established, the PS icon turns active. If a wireless network is unavailable, you can create a direct IP connection between ColoRotate and Photoshop. In ColoRotate, tap the PS icon in the lower-right corner of the app. In the Connections window, tap New. 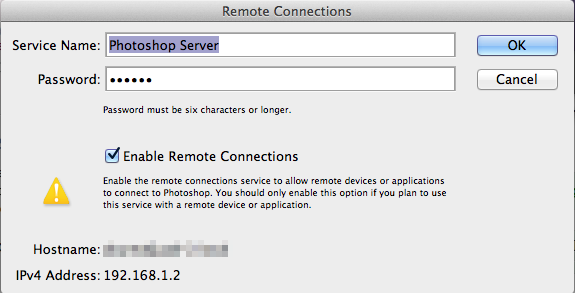 Enter the IP address and password from the Photoshop Remote Connections dialog box. Note: For help troubleshooting IP connections, see Adobe’s support document Troubleshoot companion app connectivity problems | Photoshop.